Jurors in the high-profile San Francisco murder trial over the 2015 slaying of Kathryn Steinle heard the defendant's voice for the first time in court Wednesday, as the prosecution played extended excerpts from an overnight interview with homicide inspectors conducted several hours after the shooting. The hour's worth of excerpts were taken from a 4½-hour videotaped interview stretching from about 1 a.m. to 5 a.m. on July 2, 2015. Video of the interview was displayed during the testimony of San Francisco police Lt. Anthony Ravano, who was a sergeant and homicide inspector in 2015. Ravano described how a series of photographs provided by bystanders helped him identify defendant Jose Ines Garcia Zarate as the person who likely shot Steinle at around 6:30 p.m. on July 1, 2015. Other officers arrested Garcia Zarate about an hour later, a mile south of the pedestrian pier on San Francisco's waterfront where Steinle was shot. Before Assistant District Attorney Diana Garcia played the video, she asked Ravano what information he had before he interrogated Garcia Zarate. Ravano said he suspected the gun used to kill Steinle was in San Francisco Bay, but police had yet to recover it. He didn't know the positions of Steinle or Garcia Zarate at the time of the shooting. He didn't know his suspect's name. Prosecutor Garcia asked Ravano if he had lied to the suspect during the interview. Ravano said he had. "I told him we recovered a firearm," he said, even though police at that time had not recovered the gun. "We matched DNA from the firearm." He said he told Garcia Zarate that they had recovered gunshot residue from his hands and that five witnesses saw him shoot Steinle. "Was it true there were five witnesses who saw the shooting?" Garcia asked. "No," Ravano said. "No one saw him shoot." On the video, three officers entered the interview room at San Francisco's Hall of Justice and roused Garcia Zarate, who appeared to be sleeping. A Spanish-speaking officer, Martin Covarrubias, read Garcia Zarate his Miranda rights from a card, in Spanish. Garcia Zarate indicated he understood each point by answering "yes" in Spanish. Ravano and Sgt. Chris Canning were asking the questions. The defendant gave his name as Juan Francisco Lopez Sanchez, an alias by which he is known in the federal prison system. Some of his initial answers don't appear to make sense. When the officers asked his birthdate, he repeatedly said "1863" in Spanish. He also said on the video that he lives in Colombia, but had been sleeping on the street in San Francisco for the past week. In fact, Garcia Zarate had been on city streets for over two months, following his release from San Francisco County Jail after the dismissal of a 20-year-old marijuana charge. He is a Mexican citizen who spent 15 of the past 20 years in federal prison for illegally re-entering the U.S. after being deported. Under questioning, he didn't initially admit to being on Pier 14 the previous evening. Garcia Zarate repeatedly said on the video that he was eating cookies or crackers near the baseball field, which is over a mile from Pier 14 but near where he was arrested. He said he had spent the day collecting aluminum cans. "I was eating because it was dinnertime," Covarrubias translated one of Garcia Zarate's answers. "That's what I was doing. I was eating crackers." Ravano showed Garcia Zarate a photograph of himself sitting on Pier 14, taken by a bystander shortly before the shooting. Garcia Zarate insisted it was someone in a similar T-shirt, but who appeared to have more hair. The videotape reveals the complexity of conducting an interrogation in two languages -- with two officers questioning the defendant and a third officer translating. At about 3 a.m., Ravano asked Garcia Zarate (through Covarrubias' translation) if he knew why he was at the Hall of Justice. Garcia Zarate said it was because he had been brought there. He then spoke very quickly, saying the Spanish word for "lawyer" several times. His defense attorneys previously tried unsuccessfully to have the rest of the interview excluded from the trial because, they argued, Garcia Zarate had invoked his Fifth Amendment right to legal counsel. Covarrubias translated one of his statements as "... speak to my lawyers and then I will tell you the truth." The officers didn't appear to address his statement. "Listen to me. Look at me. This is you," Ravano said, pointing to a photograph on the table. "We know this is you." Garcia Zarate responded in Spanish: "Do what you have to do. The proof is right there." Ravano continued: "Right here, something very bad happened and you had a pistol in your hand. And you threw it into the bay." Garcia Zarate responded, according to Covarrubias' translation: "I want my money and lawyer." Ravano continued: "At around 6:30, that girl was shot. She's hurt. And a lot of people were there to see what happened. Did you see what happened?" "I did not see anything," Garcia Zarate said, according to Covarrubias' translation. "It was dinnertime and I was eating." Ravano and Canning left the room at about 3:37 a.m. and Covarrubias and Garcia Zarate continued to talk for over an hour, but that part of the video was not played in court. The two homicide inspectors returned to the room just before 5 a.m.
"I want to know why you shot the girl and threw the pistol in the water," one of them said. "I don't know," Garcia Zarate responded in Spanish. "Did you fire the shot?" Ravano asked. "Yes," Garcia Zarate answered in Spanish. "Were you mad? Were you sad?" Ravano asked. "I don't know," Garcia Zarate said in English. After a long pause, "I don't know," Garcia Zarate said in Spanish. "After she was shot, did you throw the gun into the water?" Ravano asked. Garcia responded in Spanish. He said, "I think I threw it, yes," according to Covarrubias' translation. Canning asked: "What were you aiming at?" In Spanish, Garcia Zarate said, "a sea lion," according to Covarrubias' translation. "There are no sea lions over there," Canning said. A few minutes later, Garcia Zarate said in Spanish that he was aiming at "a black fish." He said he remembered throwing the gun into the bay. He said he fired a single shot. One of the inspectors asked him how he got the gun. "When I got there," Garcia Zarate said in Spanish, according to Covarrubias' translation, "When I was walking along, there was a rag and I stepped on it and it fired and I grabbed it and tossed it." The defense is arguing that Garcia Zarate picked up an object wrapped in cloth and didn't know what it was until it fired. He continued: "I was trying to prevent the gun from shooting by itself," according to the translation. Canning knelt down next to Garcia Zarate and lowered his voice. "I understand you're scared," he said. "The truth is very important. The truth is going to help everybody understand why you did what you did." He continued: "As difficult as the truth can be, the truth is always the best. So please, tell us the truth. No lies. You didn't step on the gun, did you?" "You pulled the trigger," Canning said. "Just once?" A few minutes later, Canning asked Garcia Zarate where he got the gun. The police would later learn it was stolen from a U.S. Bureau of Land Management ranger's car four days before Steinle was shot, but at the time they hadn't yet recovered it from the bay. "I don't believe you found it on the dock," Canning said. "Where did you find it?" Garcia Zarate answered in Spanish: "That's where I found it." Ravano asked him about his intent when he found the gun, an issue central to the murder trial currently underway. "Did you mean to do it?" Ravano asked. "Was it an accident?" Ravano asked. "Yes," Garcia Zarate said in Spanish. "But you made the decision to pull the trigger?" Ravano asked. Ravano asked Garcia Zarate again why he threw the gun in the water, and Officer Covarrubias translated. "He had no choice but to get rid of it because if he had not it would have continued to fire," Covarrubias said. Ravano asked Garcia Zarate how he felt after learning that Steinle was killed. Garcia Zarate said he didn't remember clearly what happened. Prodded further, he said in Spanish: "I just want to sign the papers that say I did it." "Thank you for finally being honest," Canning said. 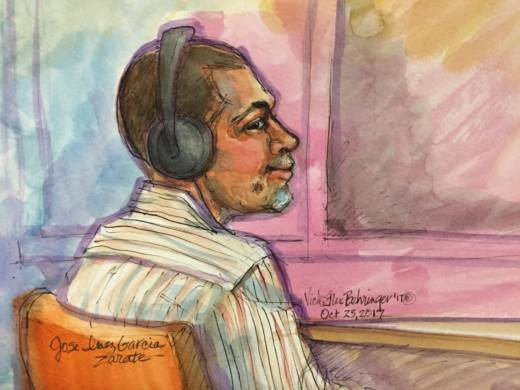 Defense attorney Matt Gonzalez, chief attorney of the San Francisco Public Defender's Office, said outside court that Garcia Zarate was outmatched by the homicide inspectors. "The fact that very skilled and experienced and educated interrogators can get a second-grade [educated] Mexican immigrant to adopt what they’re saying, like that Kate Steinle was 5 feet away when the gun discharged -- that doesn’t make it true," he said. In fact, Garcia Zarate was about 90 feet from her. Ravano's testimony is expected to continue Thursday with cross-examination by Gonzalez.